SAVE YOUR TIME AND MONEY: Soft and durable silicone bags are good choice in your bakery room, they will never break or burst. 3 sizes reusable piping bags (S: 12.2"*6.69", M: 13.38"*7.48", L: 15.35"*9.05") and bonus 6 couplers meet all cake decorating projects. You can use each bag for a different icing color without frequently changing and washing bags. Bonus couplers help to fast changing piping tips. Happy to decorate different colors cakes or cupcakes at the same time. EASY USE AND WASH: Silicone pastry bag can be easily trimmed and work with any decorating couplers and tips. Smooth interior is easy squeezing and washing. Anti-slip rough exterior is good for gripping. Just screw On/Off the couplers to fast changing nozzles, and you can make different patterns at once. 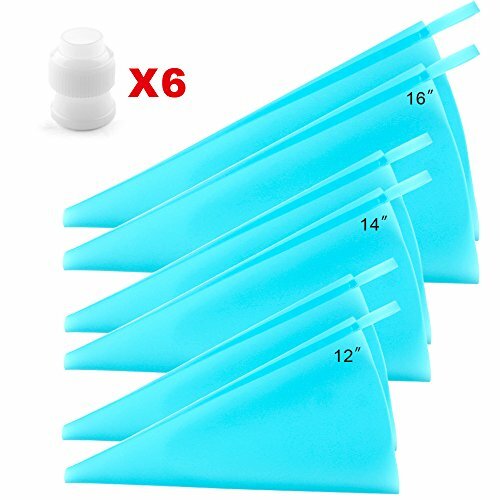 MORE PIPING BAGS AND COUPLERS: Durable silicone cake decorating bags are designed for repeated use. But to decorate cakes with your kids and friends with different icing colors or decorating patterns, you may need more than one piping bags. We have 6 piping bags and 6 couplers, just satisfy your needs. FREE LIFETIME GUARANTEE: We are confident to the quality of our silicone bags set. We will give you full refund with no question asked if you have any unhappy purchase experience, but we are sure to say that you will love it!♥♥Frequently used with Weetiee HOT-SALE MUST-HAVE New Design russian tips set (Asin: B077BR6XVJ). If you have any questions about this product by Weetiee, contact us by completing and submitting the form below. If you are looking for a specif part number, please include it with your message.